Scotland, Spain, Croatia & Poland performed at both venues. Scotland, Spain & Croatia were on the pedestrian area beside the National Gallery. Scotland, Spain & Croatia were be dancing in The Grassmarket. then on to Anstruther with dancing at the Harbour. Scotland, Spain, Croatia, China & Poland were dancing in this gala performance. Scotland, Spain, Croatia & Poland in their last performance together. It rained, but we had a successfull performance in the big chapel. The "Varazdin Folk Dance Ensemble" was formed in 1998 to protect, save, and perform Croatian traditional culture, folk dances, songs, music and costume. The ensemble promotes high artistic values in preparing traditional dances and songs for stage performances. In addition to dance programs with live music, the ensemble can perform as a folklore choir and a tamburizza orchestra. It performs in authentic, hand-made costumes. Since its beginnings, the ensemble has appeared at more than 100 festivals in 20 European countries, and in 2015, it won the national review of Croatian folk dance ensemble. 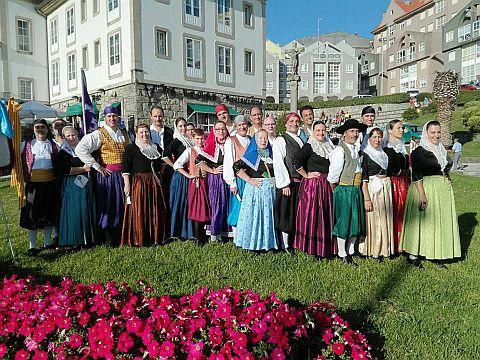 The group are the "Balladors des Raiguer", the dancers of Raiguer, which is a region on the island. It was founded in October of 2015, by musicians and dancers with much experience in other groups. It is concerned with all aspects of the traditional culture of the region and its objective is to spread the region's culture through its dances, music, and costumes. The oral use of the Catalan language is a basic aspect of this. The dances they perform are from their local area: thereby conserving the four 'boleros' of the schools of the old masters of Marratxi, Mallorca. The costume imitates those of the eighteenth century until the beginning of the twentieth century. The group has performed in many places within the island, elsewhere in Spain and abroad, and runs its own fesival, "Terra de Fang", on Mallorca. 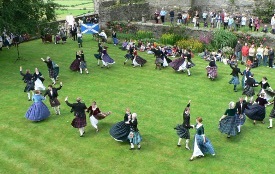 During this festival, we were also joined by two Edinburgh based International Folk Dance groups. They performed in our Gala Theatre Performance on Friday, July 21st and also in some of the other events. Polish Dance Ensemble 'Ojczyzna' is being led by Stefan Boron - artistic director of a Polish Song and Dance Ensemble Ojczyzna which existed in Edinburgh for over 30 years. Now as a part of Polish Cultural Festival Association project they are aiming to promote Polish dance in Scotland and beyond. 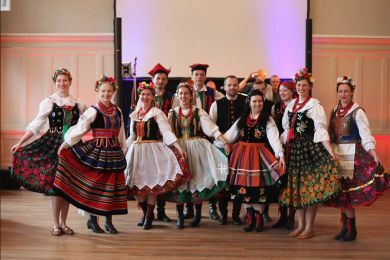 Polish Dance Ensemble 'Ojczyzna' was set up in May 2014 as a part of the Polish Scottish Heritage Festival Project - Ceilidh with a Polish Twist as a pilot project to continue dancing in a spirit and tradition of the former Ojczyzna Group. During the early years of the Dunedin Festival, Dunedin Dancers had many contacts with Ojczyzna, and we are glad to pick up the thread and renew our friendship! Edinburgh Chinese Arts Association (ECAA) is a voluntary, not-for-profit, independent arts association group founded in 2013. All of their members are music and dance lovers and include both professionals and amateurs. 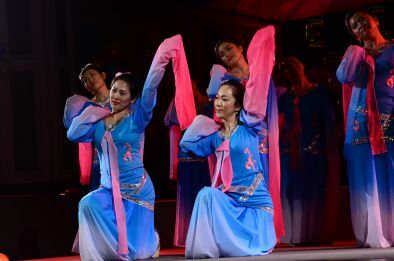 Their purpose is to improve Edinburgh's Chinese artistic pursuits, dissemination and display of Chinese arts, to prosper Edinburgh's multi-ethnic, multi-cultural and artistic atmosphere. ECCA also aims to foster community engagement and increase community cohesion through arts and culture. ECCA has participated in the Edinburgh Mela, Edinburgh Festival Carnival, Chinese New Year and many other local events in last three years. The group successfully organised a charity show in November 2016. Dunedin Dancers is an amateur group financed mainly through money raised from our own membership, from the income of our demonstration dancing, and a few donations from well wishers. This year we have been fortunate to secure a small grant from Tasgadh (Small grants for Traditional Arts), a fund devolved from Creative Scotland and managed by Fèisean nan Gàidheal. This will cover less than 5% of the festival costs. We would be very grateful if you would support or continue to support our festival by making a donation online using a credit or debit card via PayPal.